New York Times and USA Today bestselling author Heather Graham has written more than a hundred novels. She’s a winner of the RWA’s Lifetime Achievement Award, and the Thriller Writers’ Silver Bullet. She is an active member of International Thriller Writers and Mystery Writers of America. I always enjoy Heather Graham’s work, and A Dangerous Game is no exception. It’s the third installment in her “New York Confidential” series, but even though I haven’t read the first two books in this trilogy, I had no problem following the backstories of the existing characters. In fact, one of the things I really liked was that when Graham writes intimate scenes between protagonist Kieran Finnegan and her boyfriend Craig Fraiser, they really show the comfort of an established relationship without feeling boring or stale. Graham is equally deft at writing intricate, fast-paced plots and vivid characters. The joy of reading something that’s part of a series is that the world you enter is rich and layered without the need for a ton of setup. The heart of the novel – the pub owned by Kieran and her brothers – was so well drawn that I found my mouth watering for shepherd’s pie, and I could hear the clanging of silverware and the driving beat of Irish rock music. This isn’t ‘just’ a romance novel, however, it’s also a mystery, and that part of the book is never forgotten, nor is plot sacrificed for character moments that wouldn’t make sense. Graham has given us another novel to devour – that’s really the way her books are best enjoyed – and, as always, I find that the experience was both entertaining and incredibly satisfying. Goes well with Irish stew served with brown bread and a glass of hard cider. 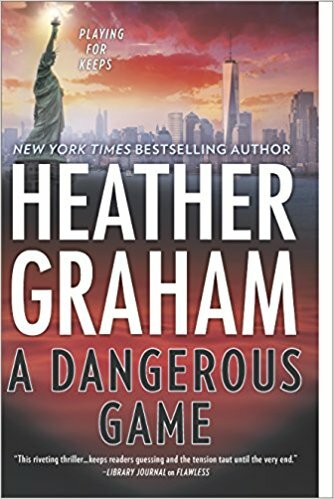 Review: A Dangerous Game, by Heather Graham by Melissa Bartell is licensed under a Creative Commons Attribution-NonCommercial-ShareAlike 4.0 International License. I like that the author is able to successfully combine and balance the romance and the mystery in such a pleasing way.